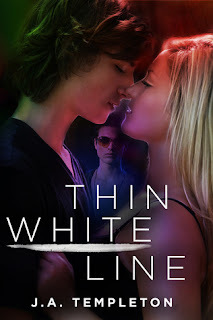 New Adult Contemporary Romance**Mature Content Warning** This book is recommended for ages 17+ due to sexual situations, drug use and strong language. I loved the idea of this book. Kenzie is a good girl and she does go a bit bad. She’s in pain and finding ways to cover it. She gets taken under her cousin Brooke’s wing at school and in life and soon finds herself in a whole new world. A world filled with hot guys and parties. This book starts out like a typical YA/NA book and quickly delves into the dark side of life, then ends on a happy go lucky note. I love all things dark twisted and real, so I was really excited when I downloaded this book (for .99cents from amazon if I recall correctly). Anyway I got right to it, and read it in one short sitting. I loved, loved, loved the first half of the book. But the second half of the book happened too fast and got a bit preachy for my tastes, which is fine. Because young people need more anti-drug messages shoved down their throats. I think. Why the sarcasm about the message, well because I’m perma stuck as an immature teenager. This whole book makes me want to start crushing my meds and abuse them, just to drown out the preachy message. Harsh? Yep, you betcha. But I frecking hate being preached to. About anything. Seriously, tell me not to do something and more than likely I will. And I am probably the most anti-drug person ever. So I am NOT advocating that people should do them, but I do not believe in being preachy. It happens to backfire more often than not. So now that I got that rant out of my system we can focus on the awesomeness that is most of this book. I loved Kenzie and her cousin Brooke’s relationship. It was great, and I loved that Brooke taught Kenzie to have more confidence. I love that Kenzie found herself in what felt like a natural way, until the end of the book and the insta-love. She may have gone about becoming her own person in the “wrong” way, but isn’t that what being young is all about. Making massive mistakes is one of those things that all young people do. Hey they are young, that stuff happens to those cute little people like insta-love and going down the “wrong” path. The love triangle was interesting, and added the right amount of sexual drama to the story. I loved Deklan. Yummy boys with tattoos. Plus I don’t feel like a pedo crushing on him. He’s of age folks!!! Yess!!! I would love to read a follow up book, because any addict can tell you that quitting drugs is not that easy. Definitely not as easy as this book made it seem. Anyway at this point, it’s the cold meds talking (I hate being sick). Just know that I enjoyed this book, A LOT, it has a bit of an edge to it, but falls flat when the story suddenly shifts gears in the middle. If it could have found a way to stay edgy, real and have the perfect solution it would have been a five star book for sure, as it is, it is still a four star book!!! **Link is an amazon associates link. The author of this post (me, Lori) receives a small kick back from anything you purchase by following this link. All money earned (which is under $2 a month) is used for giveaways and this blog.